An example of a lit luminary memorial from last year. One of the largest SPCA fundraisers for the year is the Pet Luminary Program that coincides with the Candlelight Processional in November at Lexington’s Hopkin’s Green. 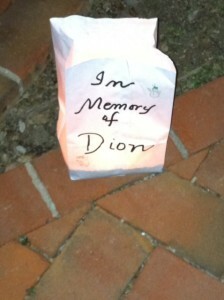 Luminaries are a great way to honor one who has given so much to you. Honor your pet and their importance to you and your family and help the SPCA at this special time of year. The Luminaries are lit and become part of the backdrop for the event that kicks off the holiday season on the day after Thanksgiving–November 23 this year–for Downtown Lexington. The Candlelight Procession goes down Main Street, ending in Hopkins Green, where the Luminaries are placed all around the circle. Books and Co…. Toys Too! The cut-off day to receive orders for luminaries is November 21. What a great Christmas or birthday present for someone!